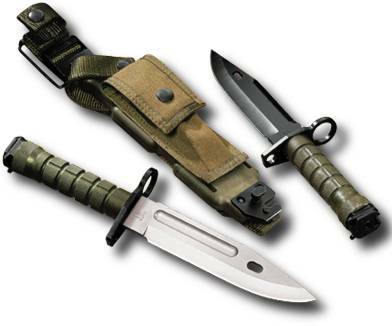 The M9 Bayonet traces it's history to a small R&D company called Qual-A-Tec. You can see a full history here. In brief, the company was created to support Special Forces and the Rambo movies were just out so they developed a knife which would later become the Buck-184 Buckmaster. In order to deal with the licensing of this knife to Buck Qual-A-Tec created the company Phrobis, Ltd. A few years later, there was a request for Proposal from the US Military for prototype bayonets and the Qual-A-Tec folks took the Buckmaster and modified it to become what we know as the M9 Bayonet today. Qual-A-Tec went on to establish a new company to handle this knife and they named this company Phrobis III, Ltd.
Buck manufactured the first M9 bayonets for Phrobis in 1987. The first contract was for 315,600 pieces with a couple of 60,000 unit options at military discretion. In total, Buck made about 325,000 bayonets between 1987 and 1989 for the US Army. Buck, without the knowledge of Phrobis III, added their date code to the first 1200 bayonets. This was not in keeping with the Technical Data Package and Phrobis instructed Buck to immediately remove the mark from any subsequently manufactured bayonets for the military. 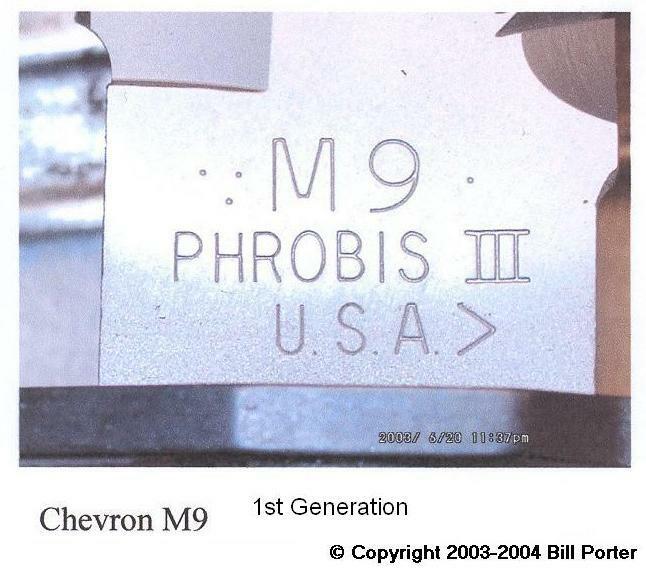 The majority of the �chevron� marked M9s had been shipped before the mark was discovered. One hundred sixty-six pieces of the 1200 piece run had not been shipped and these were held back. The bayonets were sequentially numbered on the right ricasso with the odd numbered bayonets going to Buck and the even numbered going to Phrobis. Buck sold their bayonets to members of the Buck Collectors Club. 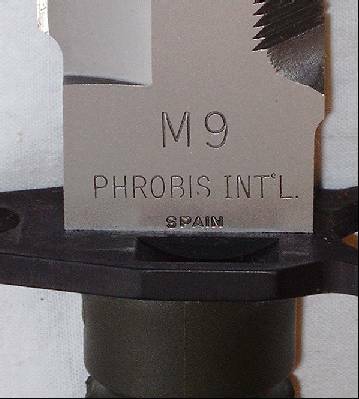 Phrobis manufactured an oak presentation plaque with the front end of an M16 rifle attached to it and sold the plaques to collectors as well as presenting them to dignitaries. These bayonets, like all the Phrobis military contract bayonets, had the Phrobis markings on the left blade ricasso and the right ricasso was unmarked. 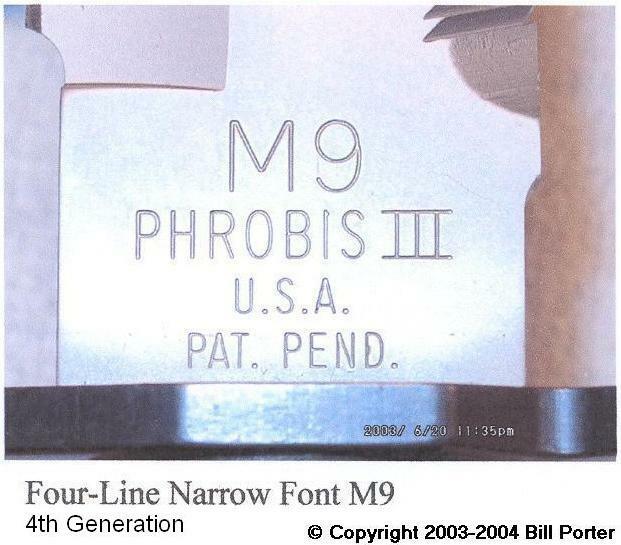 Buck continued to manufacture the M9 bayonet under subcontract for Phrobis until 1989 when the contract was terminated for mutual convenience between Buck and the Phrobis. At the end of the contract there was a falling out between the two companies and as part of the settlement Buck ended up with the rights to the M9 bayonet in the United States. 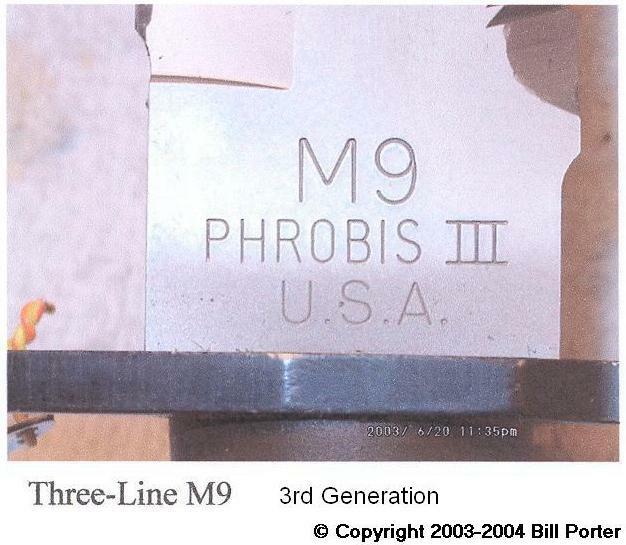 Buck did not buy out or take control of Phrobis III, instead Mickey Finn, the designer of the M9 bayonet and the owner of Phrobis III, still holds the Phrobis trademark. Around the time of the Buck/Phrobis falling out, Mickey Finn incorporated under the name Phrobis Int'l. He had been working on some inproved designs for the M9 bayonets but no longer had Buck to manufacture the blades and component parts. He then turned to the well known firm of Marto in Spain. Marto manufactured the blades for Phrobis Int'l and due to the import laws the blades had to be marked with the country of origin. The patent information was also added to the right ricasso. 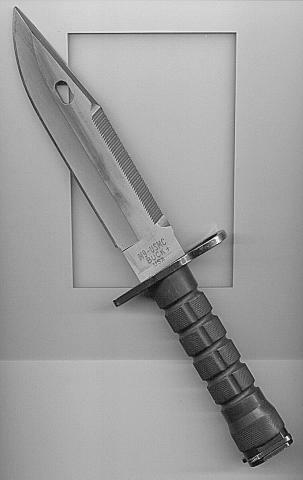 Marto was permitted to manufacture the M9 bayonet with their name on the blade strictly for commercial sales in Europe. Concurently to the manufacture of the Military Contract M9 Bayonets as described above, Buck was also manufacturing M9 bayonets for the commercial market. The commercial bayonets were almost identical to the military bayonet in that the left ricasso of the commercial M9 bayonet had the same markings as the military model but in addition it had Buck�s name and model number on the right ricasso. This carried through the length of the military contract that ended in 1989. In 1990, having completed the military contract and having broken ties with Phrobis, Buck moved their company name and model designation to the left ricasso and the right ricasso was left blank. In 1991, Buck made 5000 units for the US Marines when a contract was put on an open bid and Buck Knives won the contract for a division level field testing order. These bayonets were used by the 2nd Marine Division. By this time, Buck had parted company with Phrobis (early 1991) and were actually bidding against Phrobis for these contracts. This is the only group of bayonets made by Buck that are solely produced and supplied by Buck without Phrobis connection. All the bayonets are of the Phrobis first generation style but have the Buck cutter plate on the scabbard. 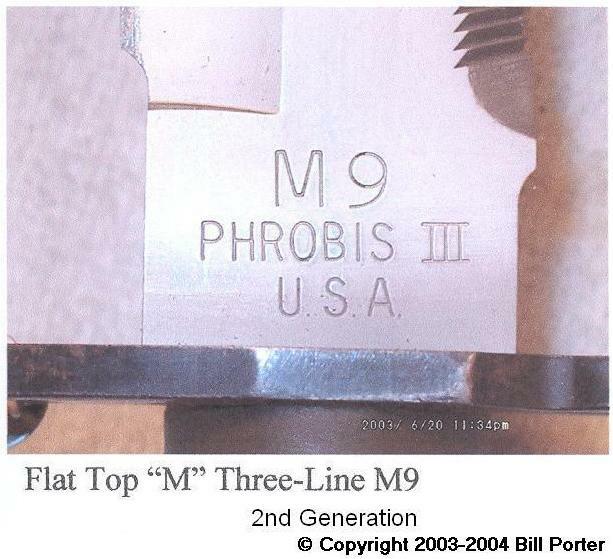 All of the blades are marked with M9-USMC and a plus (+) mark as this is the Buck date code for 1991. All 5000 of the (+) marked M9 bayonets have the short threaded tang that projects through the crossguard and a standard tang rod. 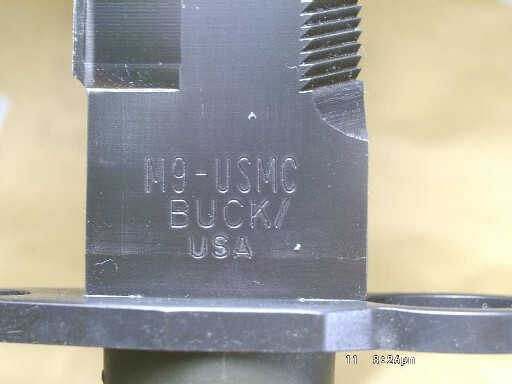 In 1993 Buck made what some consider the best version of the M9 bayonet. In this contract, Buck made 350 prototype M9 bayonets for the USMC. these are referred to as the "riveted Pommel" bayonets although only half of these were riveted while the other half had the tang drilled and threaded. These M9 bayonets were actually made in three separate and distinctly different styles, two of which were submitted to the USMC for testing and of these knives most were destroyed during the testing. These were made of all stainless steel instead of a mix of carbon steel for the parts and 425 mod for the blade. The marines liked this version,of the M9 bayonet but the military wanted to buy the same bayonets for all services and the Marine version was discontinued. Buck�s contract to manufacture the M9 lasted for 3 years, the options were not used and the contract was opened to lowest bidder. Buck cut margin to the bone, hoping to make up margin on civilian units but were underbid by LanCay . Buck continued to manufacture commercial bayonets until 1997 when their tooling wore out and production volumes did not justify replacing it. Buck 188 Production numbers based on the number of knives shipped. Credits: I have gathered a considerable amount of information from the work of others and I wish to thank as many as possible. I would like to thank Bill Porter for helping me with quite a few corrections and updates of the information here as well as providing a huge amount of content to the website. I also wish to give credit to Frank Trzaska USMilitaryknives.com for some of the information as well as other information that was incorporated into this page. I also wish to share credit to the various members of bladeforums.com, knifeforums.com, and eBay where I have collected countless images and details that I have included.